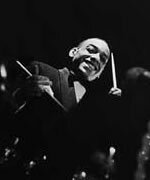 Unable to read sheet music and hunchbacked from tuberculosis of the spine, drummer William Henry "Chick" Webb stood less than five feet tall but towered over his rivals. Webb's superb memory propelled him to the heights of showmanship, making him a famous and influential musician. His total recall enabled him to play impeccably just about any musical composition. Webb used custom-made pedals, a 28-inch bass drum, and other modified percussion devices to create powerful, multi-layered drum solos. His impressive technique, imaginative breaks, and sense of swing set the tone (and the beat) for many drummers to follow. By age 20 he was bandleader at the Savoy Ballroom, where his group regularly bested all comers in the Battle of the Bands. At the 1937 event—an intense showdown before a record-breaking crowd of 4,000—Webb's band outplayed the Benny Goodman orchestra. Fellow band members never quite matched Webb's musical mastery, and the group's recordings have not endured as well as those of his contemporaries. 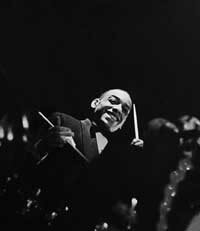 In the band's Swing Era heyday, though, Edgar Sampson's arrangements spotlighted Webb's drum pyrotechnics in a distinctive style that proved enormously popular. Webb's jamming with singer Ella Fitzgerald amplified the renown of both. In 1935 he backed Ella on her biggest-selling record to date, "A Tisket, a Tasket." Duke Ellington cited Webb as a profound influence on his own music. Webb played the drums as audience members danced the Lindy Hop. Like George Snowden, he was called the "King of Savoy." He was the bandleader at the Savoy Ballroom.